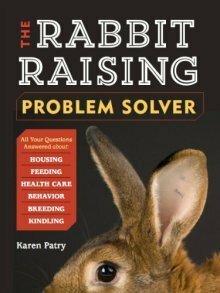 I’ve been considering raising rabbits for a couple years now, collecting materials and accessories. A month ago, I was flung into it when a friend discovered two abandoned rabbits (Californians) the family had moved out on and the neighbors were feeding until they could be rescued. They were in a make shift hutch with screen door hooks and chicken wire, with a quarter bag of moldy pellets. I had a rough idea of how I wanted to build it, with two levels of four units to maximize my space. Other than that, I was clueless. My grandfather had raised rabbits, but he didn't let us kids mess with them much. I found myself on your website, trying to learn what I could. Yours, and Rudolph’s Rabbit Ranch are wealths of information. Additionally, I found that my neighbor had raised 500 rabbits in the past and he showed me his remaining hutch which he now raises his chicks in. I set to work that weekend building my frame with the suggested 6 square feet per unit. Over-all, it is 8 feet wide (2ft per) and 3 feet deep. I now wish I had not built them that deep as it's not possible to reach the back. 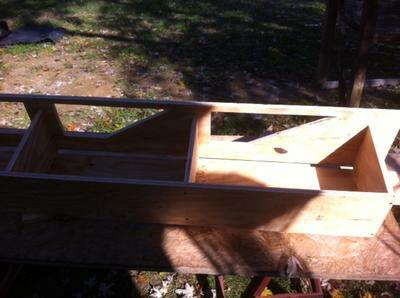 The neighbor had built his nest boxes onto the back so the kits would be more accessible, and I used the dimensions from The Nature Trail website, only a little bigger (8x10.5x20 DWL) It took me a few weeks to finish in my spare time, but this past Friday (11/23/12) was moving day for them, and then doubled my herd Saturday with donated satins. Cold weather is setting in here in southern Indiana (Evansville) and that's presenting some challenges. I know they have fur coats, but understand they can freeze to death. I have equipped the front and sides with heavy rubber roofing flaps to roll down when it gets frigid, but how cold is that cold? I've read that they need ventilation to prevent lung issues from the feces and ammonia, so I want to use them sparingly. Do I need to hang clamp heat lamps in with them also, and at what temps? What are your feelings about heated water bowls? Will water bottles burst? I’ve stuffed the nest boxes with straw, but he keeps eating his. She did the first couple days, but now sleeps in it. The two new satins haven’t checked their boxes out yet. I built them with wire bottoms, lined them with cardboard cut from 30 packs, and picked up pine shavings for bedding today. They also had red cedar, but I read your advisements about cedar last night. I wanted to breed them, but this week would have them kindle between Christmas and New Year, so I’d rather wait. I’ll review nutrition requirements again when I get there. For now, are Purina Complete pellets okay? And I have questions about their “salad.” They seem to enjoy asparagus and brussel sprout, cabbage and broccoli leaves from my fall garden, but I’ve read elsewhere those may not be a good choice. Turnip, radish and beet greens are okay? I’m attaching a few photos and am willing to share more, but I’ll close here for now. Again, I want to thank you for all the information I’ve been able to gather from your website, and I will refer to it often. Any advice you care to share with me would be greatly appreciated. I still have a gazillion questions. Yes, experience is a great teacher, though time and resource consuming. I'm going to make a change to the front of the cages to enable me to drop the front of each hutch (hinged) so I can reach all the way in to the back, once I remove the feeders. I can see where rolled (asphalt) roofing would be harder to clean. I was fortunate to have a roofer buddy hook me up with some rubber roof they were replacing at a local school. I had plenty to not only roof both levels (making the lower level easy to hose off) and make overlapping weather flaps for the front and sides. 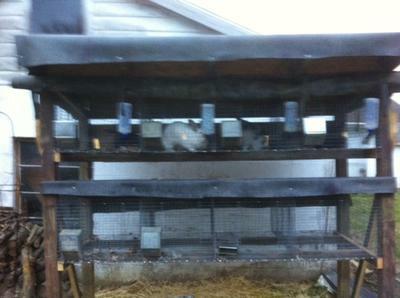 The only wood inside the cages are the boards I put in to let them get off the wire when they want to rest their feet. The rear mounted nest boxes are made of wood with wire bottoms, lined with cardboard for wind resistance and to retain the pine shavings and straw. The Californian buck keeps pulling his straw out and destroying the cardboard. Maybe he'll change up once it gets colder. While I'm not height challenged, it still sets a little high for me too, so I'm going to plant the legs about a foot. That should also help out with it's resistance to blowing over from the back, especially when the wind flaps are down in front and the wind blows from the west. I might also strap it to the back of the garage for more insurance from tipping. Good luck with your rabbits, and experience will help us all as we re-think our designs, learning from our mistakes, as well as others. Happy rabbiting! Great design on the Hare Hilton. My husband built an enclosure, and over time have found things that we will do different next time. 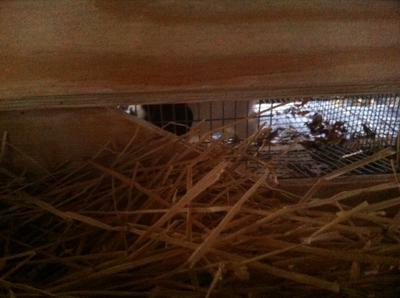 He used rolled roofing, although it is fine on top, it is impossible for me to keep clean for rabbits on bottom floor. I am height challenged and find it tough to reach in cleaning and also to catch the rabbits. Need him to catch and handle the adults, cause I'm too short. I find that the wood frame absorbs urine. 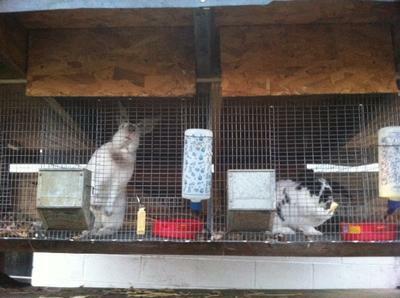 Originally he built the nestboxes into the hutch, but rabbits used it for their toilet, so replaced boxes with a flat piece of wood (to give rabbits something to rest on, other than the wire). You guessed it, they use that as a toilet and although I clean cages every day and wash down hutch and cement with hose, think they will deteriorate more rapidly.